Prepare to be amazed by the high-flying, gravity-defying and endlessly-entertaining Triton Troupers Circus as it makes its return to campus April 6-8. 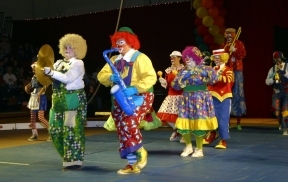 Clowns, trapeze-artists and other talented performers will be part of the annual show on Triton College’s main campus in River Grove. The Triton Troupers Circus has entertained crowds of all ages for decades with exciting acts including tightrope walking, stunts, cycling, juggling, the gym wheel, teeterboard, stilt walking and more. The show will take place in the Robert M. Collins Gymnasium, in the R Building, on Triton’s campus located at 2000 Fifth Ave. in River Grove. Showtimes are 7 p.m. Thursday through Saturday, April 6-8; and 1 p.m. Saturday, April 8. Saturday’s 1 p.m. show will be interpreted for the hearing impaired by the Triton College Center for Access and Accommodative Services. Doors open an hour before the shows and will include a clown pre-show. Tickets are $6 (no debit or credit cards accepted) and available at the door. 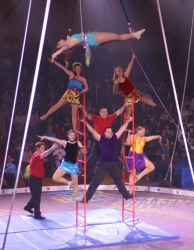 For more information about the circus, call (708) 456-0300, Ext. 3383, or visit http://tritontrouperscircus.com.